Can smoke spark severe tornadoes? Early one April morning, a Yucatán farmer stooped over the stubble of his sugar cane field to set it on fire. Torching it would make a bed of rich ash for new seedlings. The smell of burning plant matter stung his nose as a great plume of smoke and soot rose up in the wind. 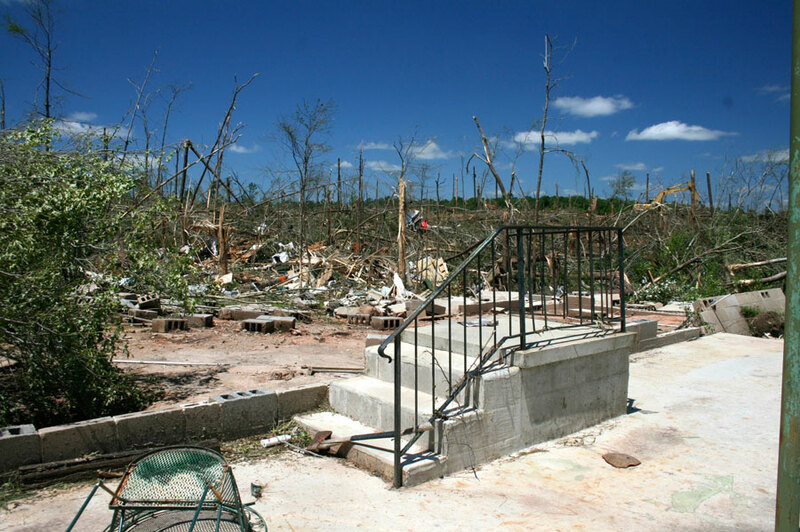 Just a few days later, a massive tornado tracked across Tuscaloosa, Alabama. Along with smoke particles, the wind carried all manner of debris: roofs and siding stripped from houses, uprooted trees, even SUVs and boats. A curtain of falling debris stretched across the sky for over 20 miles. 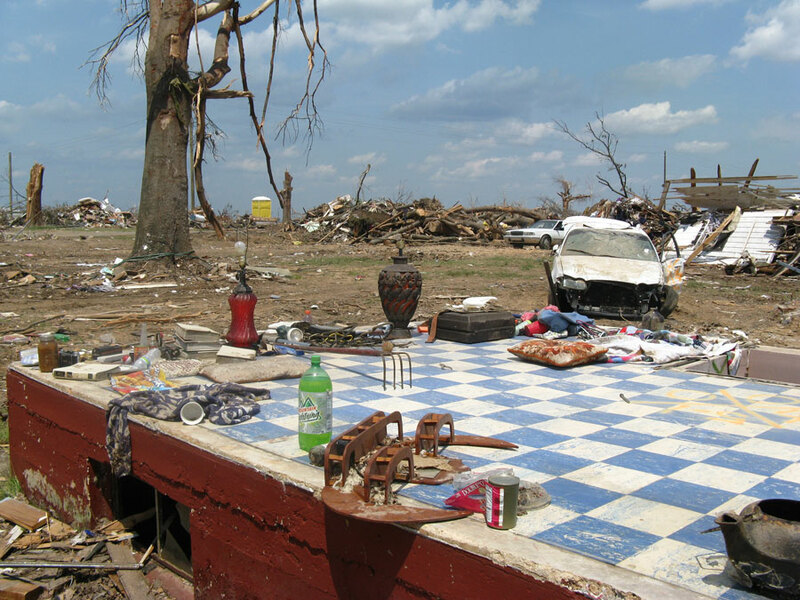 A total of 122 tornadoes spun through the southeastern United States on April 27, 2011, killing 313 people, one of the deadliest outbreaks in U.S. history. Were these two events connected? At the National Center for Atmospheric Research (NCAR) in Colorado, researcher Pablo Saide squinted at satellite images taken that week in April 2011. He spotted the giant smoke plume heading from the Yucatán towards the United States. 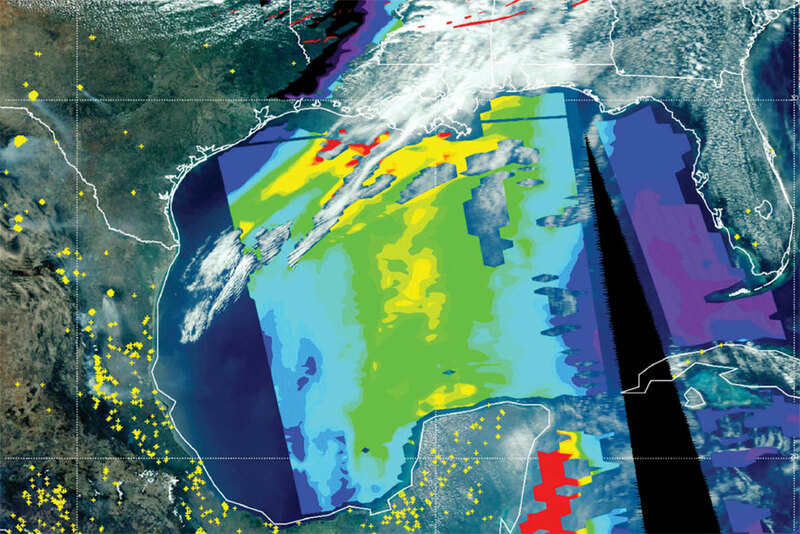 Like other scientists, he had suspected a connection between yearly field-clearing fires in the Yucatán and South America, and severe tornadoes in the southeastern United States. If he could show how they were connected, information on smoke could be added to severe weather forecasts to help save lives. Scientists have long understood that smoke can intensify severe weather by increasing cloudiness, thunderstorm cloud heights, and lightning. But how smoke might worsen tornado outbreaks was not well understood, so weather forecast models could not use the smoke information to help predict dangerous conditions. Tornadoes form when two different air masses meet during powerful storms. Under these conditions, cold air can trap warm air. With nowhere to rise, the warm air begins to spin. Sunlight pierces the storm clouds here and there, heating still more air on the ground. Energy builds, until eventually the spinning air mass has enough pent-up energy to bust through the cold air barrier and shoot skyward. This happens over the southeastern United States each spring and summer as warm, wet air from the Gulf of Mexico meets cold, dry air from Canada. Scientists thought that tiny smoke and soot particles, or aerosols, influence convection by suppressing rain and causing more updraft, suggesting a connection to severe storms. But had this been seen in actual events? Saide traced the plume northward over the Gulf of Mexico, but it stopped short of the outbreak. He was looking for bright clouds. Aerosols like smoke and dust reflect and absorb sunlight, and even attract cloud droplets. This can make clouds brighter and affect temperature and wind. Brighter clouds mean less sunlight reaches the ground and more is scattered back into the atmosphere. These interactions get complicated quickly and are what scientists call feedback, clues to atmospheric behavior. All that data meant they could simulate the conditions on the days leading up to the April 27 outbreak. Did the smoke reach the southeastern United States? Saide said, “In the model world you can turn off and on different processes, so we ran a couple of simulations, one with smoke and one without.” Comparing the two made it clear that smoke was changing conditions as it traveled to the scene of the outbreak. But it did not get them close enough to the tornadoes. Forecast models that the National Weather Service (NWS) uses to predict severe weather cannot spot tornadoes. Instead of focusing on smaller regions where tornadoes form, these models keep tabs on the entire continent. To get around this limitation, Saide and his team looked for weather that accompanies tornadoes, the same conditions used in tornado forecasts. Low clouds blanketing the sky and a lot of low altitude wind shear are often spotted before strong tornado outbreaks, for instance. Next, they fed the smoke data through a weather forecast model that also forecasts air quality by accounting for particles and gases. “The cool thing about this model is that it can represent interactions between aerosols and weather,” Saide said. They ran simulations, with and without smoke, to see if smoke and soot were affecting the conditions where tornadoes formed. Indeed they were and for the first time they could see how. Saide said, “It was hard to convince people this is actually happening.” How clouds and sunlight interact with aerosols is still a big question in climate science. But no previous study had looked at the same conditions used to predict tornadoes. By doing so, the team found that smoke affects precisely where, when, and how much energy is released as tornadoes. The air masses carrying smoke and soot aerosols reflect heat more efficiently, and that causes the temperature difference between the front air masses to be much sharper. Scott Spak, a researcher at the University of Iowa, said, “We found that smoke causes the tornadoes to wait just a little longer until the situation becomes just a little more unstable.” That waiting creates a lower cloud base. It in turn changes the difference in wind between the surface and the cloud level from which tornadoes come down. Like winding up a spring, that lower cloud base traps even more spinning wind beneath it. “You’re compressing the building of energy,” Spak said, “and the fact that there’s more wind shear means you have more likelihood of forming a twister rather than just different wind at different levels.” The result is a lot of power waiting to be unleashed. These findings have explained how smoke can play a role in forming tornadoes, and are novel in that they were the first to come from a real-world case study, but Saide cautions that it is just one study. He is repeating this exercise for multiple outbreaks over multiple years to see if the results are similar to those of the April 27, 2011 outbreak. Saide said, “We get at this tornado likelihood kind of indirectly by using environmental conditions.” Their plan is to run the model at a higher resolution to capture conditions directly. “If we continue to find that these interactions are important, we need to add aerosol interactions to weather forecasting,” he said. For timely results, weather prediction models need to run in hours, however, and the team’s current model takes days. Finding simpler aerosol models that still yield good results is a big priority. “What I find really exciting is that we’re starting to understand just how important such tiny particles can be,” Saide said. NASA Atmospheric Science Data Center (ASDC). 2011. CALIOP Level 3 Aerosol Profile. Hampton, VA, USA. doi:10.5067/CALIOP/CALIPSO/CAL_LID_L3_APro_CloudFree-Standard-V3-00. NASA Land Processes DAAC (LP DAAC). 2011. MOD14. USGS/Earth Resources Observation and Science (EROS) Center, Sioux Falls, SD. https://lpdaac.usgs.gov/dataset_discovery/modis/modis_products_table/mod14. NASA Land Processes DAAC (LP DAAC). 2011. MYD14. USGS/Earth Resources Observation and Science (EROS) Center, Sioux Falls, SD. https://lpdaac.usgs.gov/dataset_discovery/modis/modis_products_table/myd14. NASA Level 1 and Atmosphere Archive and Distribution System (LAADS) DAAC. 2011. MOD06_L2, MOD03, and MYD03. Greenbelt, MD, USA. https://ladsweb.nascom.nasa.gov/search/. Saide, P. E., S. N. Spak, R. B. Pierce, J. A. Otkin, T. K. Schaack, A. K. Heidinger, A. M. daSilva, M. Kacenelenbogen, J. Redemann, and G. R. Carmichael. 2015. 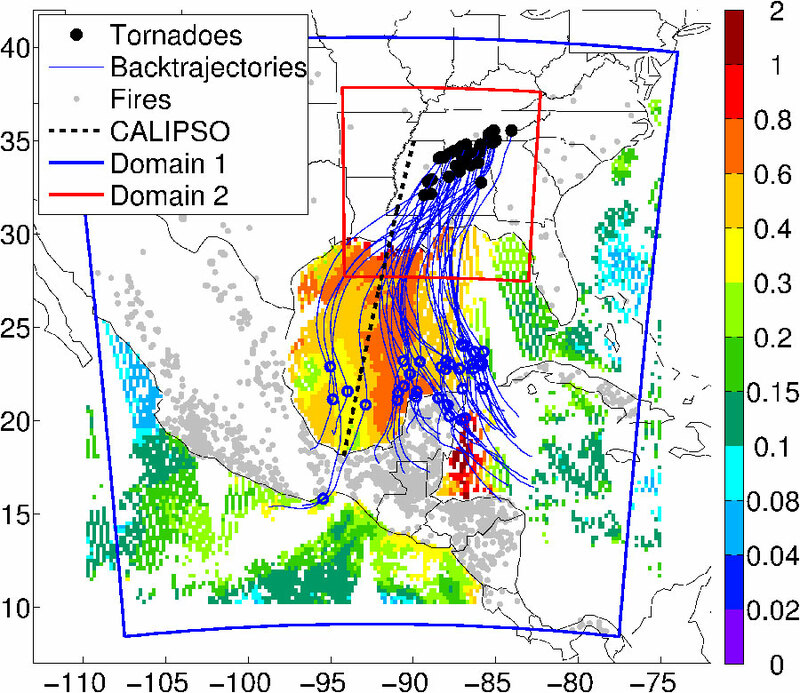 Central American biomass burning smoke can increase tornado severity in the U.S. Geophysical Research Letters 42: 956–965. doi:10.1002/2014GL062826.